We are back working on the Old Vicarage site, excavating two test pits in the triangular field. 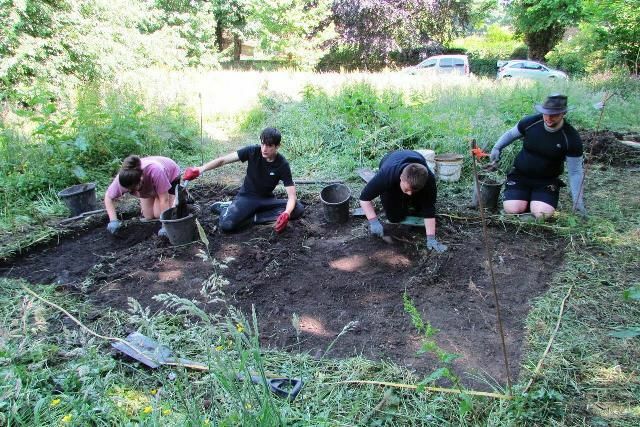 Students from Marple College, led by an Archaeologist from Salford University, are spending their ‘Work Experience’ week with Mellor Archaeological Trust. The dig is taking place from 25th to 29th June and members of the public are welcome to visit the site which is situated at the top of Church Road in Mellor. The first day has seen the students removing the turf from the area and today they should get down to the interesting layers below which tell the story of occupation of the hilltop when the inhabitants lived in Roundhouses. There is a replica Roundhouse at the site which, although only 1/3rd actual size gives a real feel for how life would have been for our Iron Age ancestors.